1 : 3700000 Rusko severozápadní Hermelin, S.G. Akerland, A.
Sweden, Denmark, Norway, and Finland from the Best Authorities. Sweden, Denmark, Norway, Finland, Iceland. 1 : 11500000 Seaman, James V.
Scandinavien bis zum Frieden von Friedrichshamm 1809. 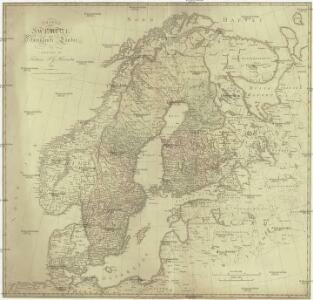 A new map of the Northern States containing the Kingdoms of Sweden, Denmark, and Norway.